Dynamics 365 will bring together the best of Microsoft’s CRM and ERP cloud offerings into one cloud service with specific, purpose-built apps for business functions like Finance, Sales, Customer Service, and Supply Chain Operations—with built-in insights, intelligence, and workflow. The apps are designed so they can be easily and independently deployed, which means you can start with the business area you need and scale as the business demands. All Dynamics 365 apps, plus the larger portfolio of cloud solutions like Office 365, will share a common data model so it will be a breeze to adopt additional capabilities. 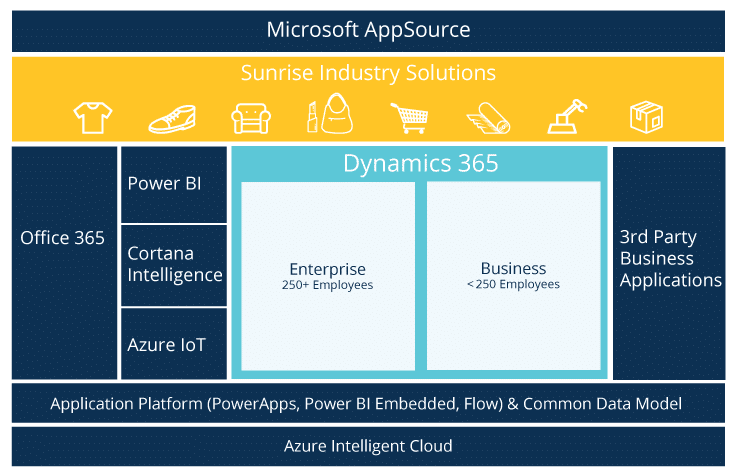 Dynamics 365 is Microsoft’s next generation of business apps in the cloud that bring together the full power of Microsoft productivity, advanced analytics, Power BI, Azure IoT, and a new common data model platform. As such, two worlds are coming together: structured business processes and unstructured productivity. The move is quite significant and warranted a name that reflects this completely fresh approach to business applications in the cloud. Dynamics 365 Enterprise Edition combines the products formerly known as Dynamics AX and Dynamics CRM along with PowerApps, Power BI and Flow into one common platform that you can mix and match or purchase as a plan with significant cost savings. How does Dynamics 365 benefit customers? It can’t be understated how gorgeous, modern, and familiar the user experience will be for employees — just like Office 365 — and here are 4 reasons why you’ll love it. Start with what you need. Dynamics 365 business apps fit specific roles so you can start with what you need (like finance and then supply chain operations or customer service) and grow at your own pace. Traditionally you’d have to purchase the entire ERP or CRM together but with this decoupled approach, you can start where you want, and pay only for what you need. Productivity where you need it. By connecting the structured workflow of business applications and processes with the unstructured work of collaboration and productivity, employees will be empowered with a merged world that reduces task/screen switching. The common data model makes it easier to surface context across Office 365, Dynamics 365, Power BI and more. Gain insights from built-in intelligence. Everyone wants dashboards and dreams of predictive and prescriptive analytics. By infusing business applications and processes with big data, advanced analytics, and IoT out-of-the-box, the tools can proactively guide employees and customers to optimal decision making and outcomes. With the power of the cloud and machine learning, you can connect what matters and transform insights into action. Be ready for growth. Organizations can reimagine their business models with a consistent, flexible, and extensible platform. These nimble applications will let them compose, modify and extend processes in real-time. You can deploy true unified commerce at a global scale and continue to grow and evolve the business software for a lifetime — all without the cost, complexity, and inflexibility of other solutions. Do Dynamics 365 apps really work together seamlessly ? With a common data model across Office 365, Power BI, Cortana Analytics, ERP (formerly Microsoft Dynamics AX), CRM and many other cloud business applications, it will be so much faster and easier than ever before to deploy and integrate solutions. Basically, all of Microsoft’s intelligent business apps will align to the new common data model, and an extensibility model, that combines existing tools with PowerApps (an app builder) and Flow (a trigger based workflow builder like Zapier and IFTTT). This evolution eliminates historical boundaries created by business applications like CRM and ERP. What does it mean to have intelligence built-in? All of the Microsoft Dynamics 365 applications have built-in insights, predictive intelligence, and workflow optimization, which will be delivered through simple, easy-to-use, mobile and web-based experiences with offline capabilities. Power BI and Cortana Intelligence will be natively embedded to help customers achieve their business goals with predictive insights, prescriptive advice, and actionable next steps. Dynamics 365 will also have connected experiences to Microsoft PowerApps and Microsoft Flow which provide application extensibility and share a common data model. What is the common data model and what role does it play with Dynamics 365? The common data model is a cloud-resident business database, built on years of experience with Microsoft enterprise customers. It will come with hundreds of standard business entities spanning both business process (Dynamics 365) and productivity (Office 365). The beauty of this approach means it will be far easier, faster, and cheaper to deploy and integrate apps than ever before with a consistent schema under the hood. How many users can Dynamics 365 support? There are two editions of Dynamics 365 – Enterprise and Business. Microsoft Dynamics 365 Enterprise Edition is optimized for large organizations over 250 employees. Microsoft Dynamics 365 Business Edition is designed for organizations up to 250 employees. Of course, the size of your organization does not necessarily dictate the version that is the best fit for you. The Enterprise version will include operations (ERP), customer service, marketing, sales, field service, and project service automation modules (basically all the decoupled pieces of CRM plus Dynamics AX for financials and supply chain). The Business version has Financials, Sales, and Marketing drawing from the new features of Project Madeira, NAV, and a lite version of CRM. It won’t have full global, omnichannel ERP capabilities like the Enterprise Edition so consumer brands and retailers (regardless of size) that are more multi-brand, multi-channel, multi-product, and multi-country should look to the Enterprise Edition (known today as Dynamics AX). How much will Dynamics 365 cost? The business application industry has traditionally presented customers with a range of siloed applications. With the Dynamics 365 launch, Microsoft has given customers new choices. While the traditional approach allows customers to license Dynamics 365 by application (Financials, Operations, Sales, Marketing, etc. ), they will also be able to license heavy users using a “Plan” or light users as “Team Members”. Both options provide significant savings for an organization. The new plan-based approach will give customers the flexibility they need to support modern, agile, and diverse employee roles – enabling them to access full functionality across all applications within Dynamics 365 with full read/write capabilities. While Team Members are considered ‘light users’ the functionality granted to them is by no means light, with nearly the same range of capabilities as a Plan user. Tiered pricing options are also available for select plans and Team Member licenses. For more information on the different licensing options, please see our Licensing Page. The full Enterprise Edition of Dynamics 365 will be available worldwide November 1, 2016. The Business Edition will be available on the same date, but will only launch with the Financials app. The Sales and Marketing applications, as well as plan-based licensing for the Business Edition, will be released Spring 2017. How will Dynamics 365 be licensed? Not only is the product strategy evolving, but Microsoft has also reinvented its approach to pricing and packaging – liberating customers from traditional business application licensing. Dynamics 365 customers have a greater degree of flexibility in choosing the licensing approach that not only works for their organization, but achieves the highest use of the product for the lowest cost. There are currently three licensing options available. Organizations have the capability to mix-and-match to achieve the perfect blend for their business’ needs and budget, and all licenses will be on a single monthly bill. Application-Only: Available upon launch in both the Enterprise Edition and the Business Edition, licensing by application is a more traditional approach. Those with application specific licenses still have access to embedded business intelligence and app specific extensibility. While application licenses are competitively priced, the potential for cost-savings decreases steadily with each standalone license purchased. Those individuals who need access to multiple applications should consider available plans for their edition. Plans: Available upon launch of the Enterprise Edition, with a roll out planned for the Business Edition once the Sales and Marketing applications are released in 2017. Plans are one of the new ways Microsoft is offering greater accessibility and flexibility to businesses. Designed for heavy or “Full Users” plan licenses cross multiple applications, allow for full read/write permissions, and offer a greater level of extensibility. There are currently two plans available for the Enterprise Edition. Plan 1 covers every application previously found in Dynamics CRM while Plan 2 encompasses everything found in Plan 1 + the Operations app (which includes all the functionality previously found in Dynamics AX). Select plans will also be eligible for tiered pricing. For the Enterprise Edition, there must be a minimum of 20 named users on either Plan 1 or Plan 2. Team Members: Available upon launch in both the Enterprise Edition and the Business Edition. Team Members (or ‘light users’) have significant functional capabilities at a significantly lower price point. The primary difference between Team Members and Full Users on a plan are read/write permissions, with Team Members having more limited capabilities. Organizations that select Dynamics 365 Enterprise Edition are eligible for tiered pricing for Team Member seats, and do not have a seat limit. Business Edition Team Member seats do not qualify for tiered pricing and have a limited number of seats available. All licenses include embedded intelligence and extensibility (the extent of which is determined by license type). These exciting developments change the speed and affordability of business applications since you only pay for what you need, when you need it, with this new, flexible licensing approach. Microsoft wants customers to have the choice to start where they want (whether that’s by business line or implementing the whole kit-and-caboodle). To date, the Dynamics AX and CRM solutions have been licensed by application, requiring cross-functional buying committees and large capital investments. But Gartner estimates that by 2017, 50% of all IT spending will be outside of the CIO’s control, shifting to line of business executives. Therefore, the market demands a new approach and this is where Microsoft is creating a unique advantage, giving line of business leaders the power to start with one business function and expand as the business demands. The new licensing model means growth and scale will be easy when all apps share a common business platform and data model. What impact does Dynamics 365 have on ROI? The flexible licensing of Dynamics 365 improves ROI as companies pay for access to the capabilities they need regardless of which application it resides in. This is unique in a market where most software vendors require customers to buy licenses for different applications and modules – resulting in 2-3x increased cost. And where other vendors fall short, Dynamics 365 Enterprise licensing includes built-in analytics with Power BI, and full usage rights to PowerApps and Microsoft Flow to compose new apps and easily extend, modify, and integrate with existing ones. Will Dynamics 365 be available on-premises? Yes. Dynamics 365 is a cloud service and Microsoft licensing allows for on-premise or private cloud deployments. Microsoft will continue to innovate Dynamics AX on-premise solutions and offer connectors for customers who wish to use a hybrid of on-premise and cloud solution. The on-premise version is Dynamics AX 2012 R3 and it is a completely different code base that will soon be called Dynamics 365 On Premise but be advised that it will not stay current with the latest feature releases. Our recommendation is to look to Dynamics 365 Enterprise or Business editions in the cloud as the last ERP you’ll ever need. You’ll always stay fresh and never need to invest in major upgrades down the road again. Should customers invest in Dynamics AX today, or wait for Dynamics 365? From our point of view, and based on the information provided by Microsoft, the Operations component of Dynamics 365 is really just a rebranding of the full Microsoft Dynamics AX product as we are implementing it today. If an organization would like to add on the additional applications (Customer Service, Sales, Field Services, etc.) once Dynamics 365 is released, Microsoft has already indicated that there will be a clear path to do that. So, why wait to leverage the power of Microsoft’s proven, cloud-based business applications when you can get started on the project today? Where do you find industry extensions and apps for Dynamics 365? As a business user, sourcing apps tailored to your role, your business, and your industry can be challenging. That’s where Microsoft AppSource will help you discover solutions and content packages from Microsoft-certified partners like Sunrise, including those built on top of Dynamics. Here you can find pre-built industry solutions like the Sunrise Supply Chain Solution for Apparel & Footwear industries so you can hit the ground running with best practices built on top of the Dynamics platform. How is AppSource different from Microsoft’s other marketplaces and destinations for apps? Does Microsoft AppSource support the purchase of apps? No. Currently, you can only discover Microsoft-certified partner solutions. Some are small apps that can be tried independently, and others are so deeply embedded in ERP and CRM functionality that they require a demo. From AppSource you will be able to contact a partner to engage in next steps. Does Dynamics 365 work for apparel, footwear, consumer goods, manufacturing, and retail companies? Yes. Microsoft’s industry strategy has not changed. They have created a cloud platform on top of which partners like Sunrise can create added value specific to micro verticals. Sunrise has long been a leading, award-winning partner for these verticals and offers pre-built extensions and implementation accelerator toolkits that will meet your specific business needs and allow you to hit the ground running. I’ve heard references to Dynamics 365 for Operations and Dynamics 365 for Financials — what’s the difference? Dynamics 365 for Operations and Dynamics 365 for Financials are just another way to describe applications found in the different editions of Dynamics 365. Dynamics 365 for Operations falls under the Enterprise Edition and encompasses everything previously found in Dynamics AX – including financial functionality. Dynamics 365 for Financials is only found in the Business Edition and is based on Project Madeira – a new cloud-based financial solution which was modeled after Dynamics NAV. Once you determine which edition is the best fit for your organization, you can trust that you’ll have robust financial functionality, no matter what.